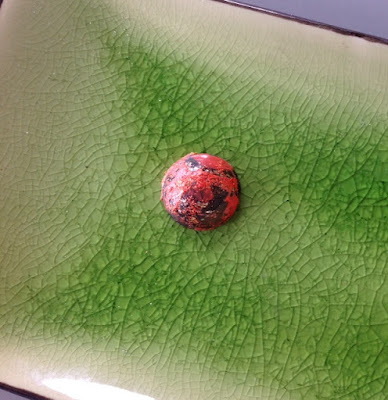 The Beadful Life @ BeadFX: Resin play! Who says that everything needs to be serious? Playtime is an essential part of the creativity process. Some may think that it’s a little frivolous, but I believe that it’s the only way to go! I do so love to play!! I spent a little time on the weekend, experimenting with Ice Resin, Iced Enamels, Iced Enamel Tints, Pebeo Prisme Fantasy paints, nail polish and Ranger Distress Paints. I made some clear resin cabochons earlier in the week, and all I needed to do was embellish them! After spotting a nail polish marbling video, on one of my Facebook groups (sorry, no link! 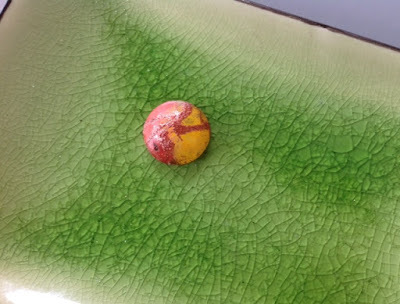 ), I decided to try it out on resin (float the nail polish in a bowl of water, and then dip-dunk the resin). Well, suffice to say that my nail polish selection is very thin, so the results were a little under whelming, but I did get some interesting colour on my nails (that’s what happens when you don’t wear gloves). But did that stop me? Not with a good selection of Iced Enamels and a heat gun! Note: not much of the nail polish remains in plain view, but next time I'll try harder! Then on to Ranger Distress paints and another cabochon! 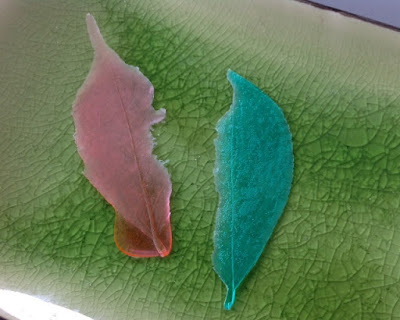 I dabbed a couple of colours on the resin, waited for it to dry, then added Iced Enamels (using a wooden skewer, to apply the Iced Enamel Medium), for a dimensional effect! I liked the effect, and plan to try out some of my other acrylic paints, in the near future. 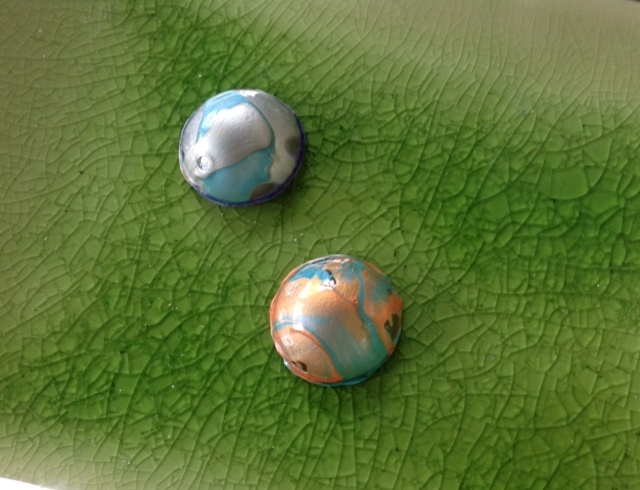 The third experiment, involved coating a couple of cabochons with Pebeo Fantasy Prisme paints. I quickly realized that the results were not going to be quite what I expected! Most of the paints slid off the rounded cabochons, and the only place the cellular effects showed (the effect these paints are known for), was in the puddles at the bottom of the cabochon. As these paints are solvent based (use these outside, or in a well ventilated room), I had to wait 72 hours for the paint to cure completely, but then I was able to simply cut off the blobs (of course I saved them). I haven’t added the next step yet, but the plan is to tart them up even further. Should I use drips of coloured resin, fire, an additional layer of Distress Paints, Iced Enamels or something else entirely? Who knows, but it will certainly be fun to figure it out! By the way, after I’m satisfied with (&/or finished embellishing) all three sets of experiments, I plan to brush on a thin, finishing coat of resin, to make them shine! 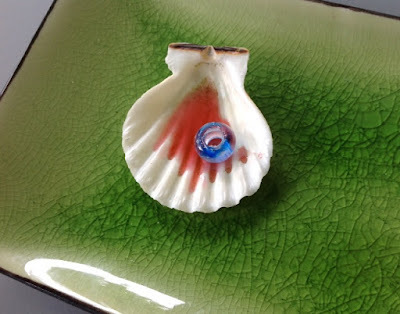 On another of my Facebook groups, someone had the brilliant idea to use up her leftover resin (the bit that’s not large enough to use, but too good to throw away) by dripping it into a seashell, to make a totally unique decoration. Mine isn’t finished yet, and I really wish that I had used either blue or green, but a girl’s got to start somewhere! The blue bead was made from clear resin and a tiny drip of one of Ranger’s new Iced Enamel tints (picked up at Bead & Button, by a very kind friend). Far from a perfect result, as the bead mold is very tiny, but I will keep on trying! The next photo is a classic fail, but that doesn't mean that I'm giving up!! I promise that I'll get it to work one of these days!!! Encourage and nurture your inner child! Play, experiment and give yourself permission to make a few mistakes. Not all play is productive, but it’s definitely necessary for growth. Besides it’s fun, and we all need more fun in our lives! !